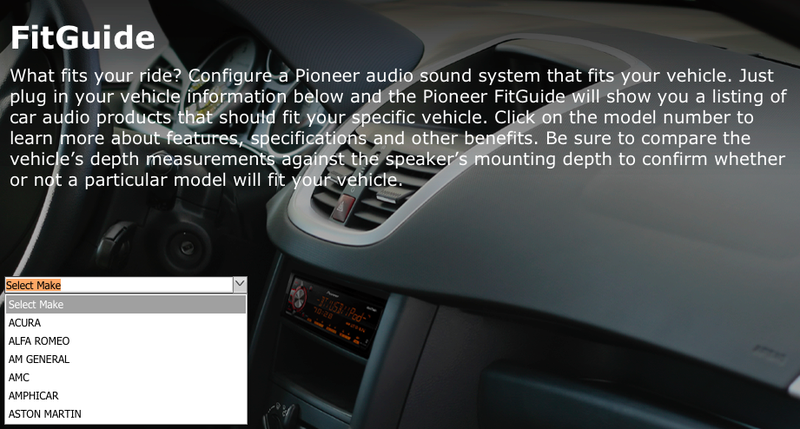 Pioneer Electronics has set up an online "FitGuide" which can be used to find the perfect sound system for your car. No matter what car you drive or how old it is, upgrading the head unit or sound system is possible in most cases. Apple's latest CarPlay technology, for example, can be enjoyed in the vehicle you already own if you have one of Pioneer's NEX receivers or AppRadio 4. Here's how you can use the FitGuide. Input your car details using the drop down menus on the website. The FitGuide will display the existing factory-installed configurations of your car along with the options you have for upgrading. Users can choose from head units, speakers, subwoofers and amplifiers. I wasn't able to scroll through the drop down lists on my Mac using the trackpad so if you have the same issue use the arrow keys on the keyboard to scroll. Apart from that the FitGuide seems to work well and serves accurate information.